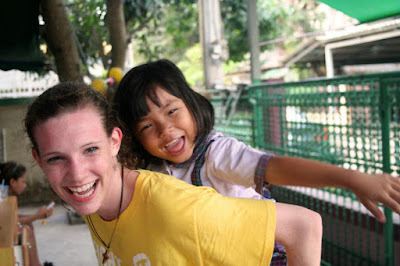 I went on a mission trip with my youth group several years ago to a coastal city in Thailand; it was my first time outside of the US, and it was an eye-opening cultural experience, from trying the mango sticky rice to experiencing my first thirteen-hour international flight, to being surrounded by people who didn’t speak my language. I was able to serve the Thai people with my team; we played with children in a Thai orphanage, brought food for and talked to those in prisons, and went out to minister to those in the slums. Anytime I build a relationship with someone (I was surprised by the connection I felt with children who didn’t speak a word of English! ), an abstract problem, like poverty, becomes a tangible story and reality in the face of a person. So Thailand holds a special place in my heart, and as I read in the news about what’s going on there, I can’t help but feel an even deeper desire than normal to see change and restoration happen. Thailand is, unfortunately, a center for human trafficking. Its status as such has not gone unnoticed by the US or the European Union; both have put pressure on Thailand, so that its human trafficking problem now jeopardizes its international trade. The international pressure for Thailand to crack down on trafficking within its borders recently spiked, after more than 30 graves near the Malaysian border around suspected trafficking camps were discovered earlier this month. This discovery—and the ensuing investigation—yielded not only further discoveries of graves and many arrests within the Thai government and Thai police force (even an influential army officer), but also had the unfortunate and saddening side effect of leaving migrants en route to various Southeast Asian countries abandoned in boats by those smuggling them in. It is estimated that as many as two thousand migrants are still out at sea, their smugglers scared off by the trafficking crackdown. So keep Thailand in your thoughts—maybe even in your prayers—this month, and perhaps consider the places in the world where you most desire to see change, healing, and restoration happen. Stories of people are powerful, and as I have learned the stories of the women at Nomi Network in India and Cambodia, the realities of human trafficking for those countries have broken my heart as those in Thailand have. What places in the world does your heart go out to the most today, and why? Thanks to The Times of India and Yahoo for the information found in this post. My favorite day serving in Thailand was playing with the children at a local orphanage. Thanks for the picture, Courtney McCarthy!